Animag Online: Congratulations on the success of your latest short at Sundance. Can you tell us a little bit about how you came up with the idea for Lies? Jonas Odell: I had done a previous film based on documentary interviews. When you work with what you like to think are true stories you naturally get a bit worried that the people telling these stories are lying. That led me to think about lies as the subject of a film. Of course we filmmakers are the biggest liars! We even make a living out of it, so I thought the subject was interesting. I also think that when you research a specific theme you find highly personal stories, stories that are worth telling that you wouldn’t find otherwise. OK, so how about the production details: How long did it take you to create the short? What kind of technologies did you use and how much did it cost to make? Odell: Researching and getting the interviews together was the lengthiest part of the process. I think that went on for more than a year while we were working on other projects. The visuals took a bit over four months to complete between shooting the live action and putting the final touches to the animation. The main bulk of the animation was created in After Effects, with a few stop motion and hand drawn line animations thrown in. What was the toughest part of the gig? Odell: The biggest challenge was working with the interviews, structuring them into a narrative and still retaining the spirit of what I felt they wanted to say. Working with documentary material you have a responsibility towards the people who are brave and generous enough to lend you their stories. Odell: I think in this case, from the stories themselves. The cinematic style as well as the graphic style had to come out of the tone of each story. Your previous shorts were well received at festivals around the world. Which ones do you like to attend most? What is your take on the whole animation festival scene? Odell: My last two films have been reasonably successful at regular film festivals and less so on the animation festival circuit so with the exception of the Ottawa animation festival I haven’t been attending any animation festivals for a while. In general I think festivals are an essential place of networking and inspiration for filmmakers. I think a successful festival is one that (like the Ottawa Animation Festival) manages to promote both the art and the business of animation, or film in general. How do you find the animation scene in Sweden? Odell: There isn’t a long unbroken tradition of animation in Sweden. There was some groundbreaking pioneer work in the 1910s and ’20s and then virtually nothing for 40 years. Nowadays there is a great digital scene with lots of talented freelance animators moving back and forth between Swedish and international jobs. There is also a bunch of people who create their own interesting independent work. 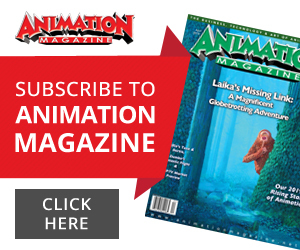 What do you think of the international animation world in 2009? Odell: Again, I’m not really qualified to make a statement seeing that I haven’t seen that much recent animation. I think one thing that will have an influence is the mobility of artists between different techniques. We see a lot more people entering animation from other fields: live action directing, documentary, fine arts, graphic design etc. as well as animators moving to other fields of work before returning to animation. I think this will eventually lead to even more diversity in both the subjects tackled by animation and the way animated films look. Who are your personal favorite animators? Which animated TV shows or movies inspire you when you were growing up? Odell: I have to confess I haven’t watched that much animation for the last couple of years, so I’m sure there are lots of people out there whose work I would love if I only saw it. The strongest animated film experience last year I think was Waltz with Bashir. Growing up in Sweden the stuff on kids’ television was quite an eclectic blend. I remember seeing Disney and Hanna Barbera animation as well as eastern European puppet films and the work of the Zagreb studio. What kind of advice would you give up and coming animators who would like to make sound, artistic projects like yours? Odell: A lot of animated films seem to be more about showcasing your animation talent than about the strong will to tell a story or make an artistic statement. I think analyzing your motives for making the film up front is essential. If you strongly want his film to exist whether you or anyone else does the animation for it, then it’s worth making. To find out more about Jonas Odell and his highly original shorts, visit his company’s website at www.filmtecknarna.se.